Hooked on Needles: Scrappy Afghan Finally Finished! 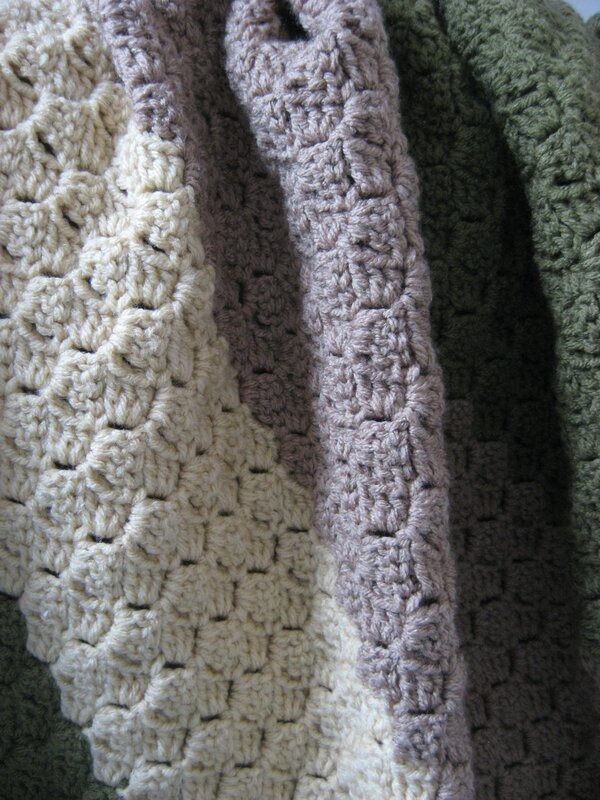 Last fall, I had the intention of using up leftover yarn from this afghan to make a shawl. 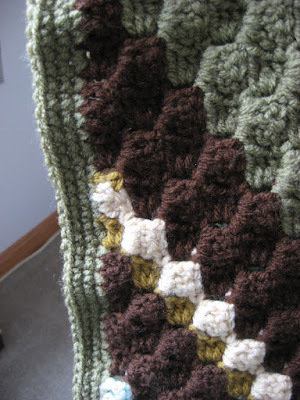 So I started crocheting my latest favorite stitch, the diagonal box stitch seen HERE and HERE, which starts at one corner and grows into an ever larger triangle making it perfect for a simple shawl design. It didn't quite work out as I had planned since I ran out of yarn long before the piece was big enough to be a useful shawl, so I changed plans and decided this project would be a scrappy afghan instead. 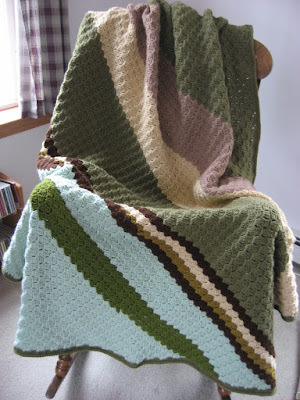 I had used Bernat Waverly yarn for a few projects so I started using up the leftovers to make this cozy, colorful, scrappy afghan. 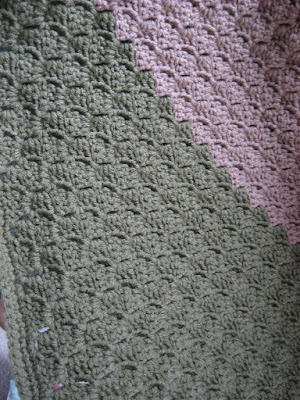 The lightest green section at the lower left in the above picture was the beginning of the project, with a stripe of darker green added to stretch the light green further. 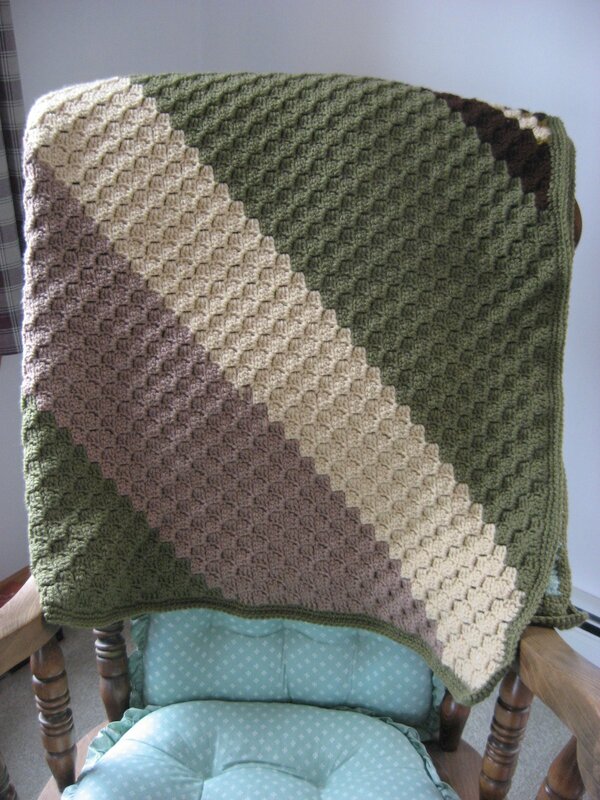 Even with the dark green stripe added, it still was not big enough for a shawl. 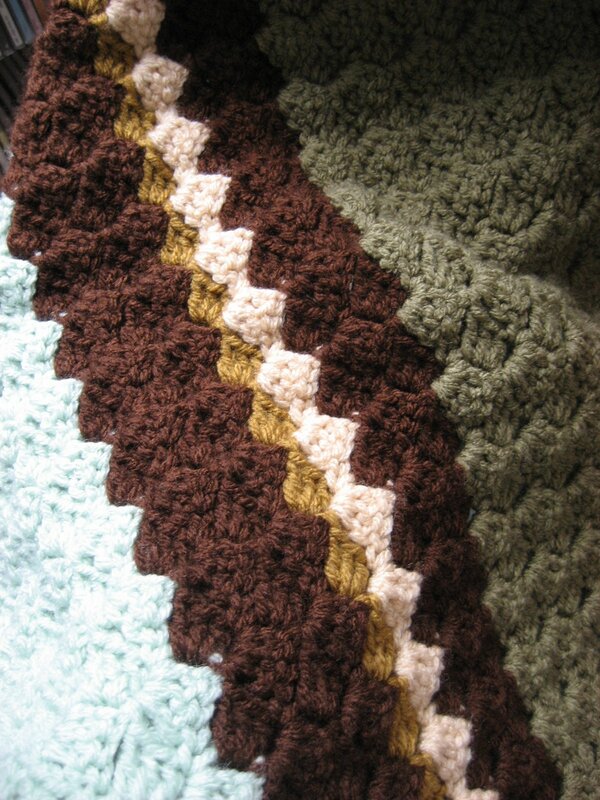 So I used up scraps of browns and tans and then switched to a different green. I was able to acquire some skeins of this green yarn, and the cream and tan yarns as well, from ebay since Bernat Waverly yarn is no longer manufactured and very hard to find. This afghan turned out to be approximately 52 by 70 inches, a very nice size for cuddling on the couch or making forts over chairs and coffee tables. 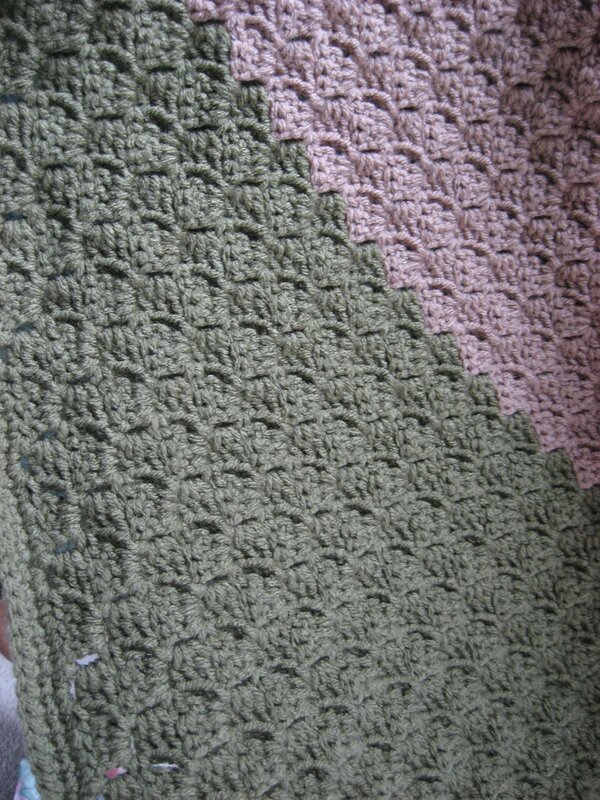 Around the edges, I added a sturdy border of single crochets so the whole afghan is wrapped in the main green color. 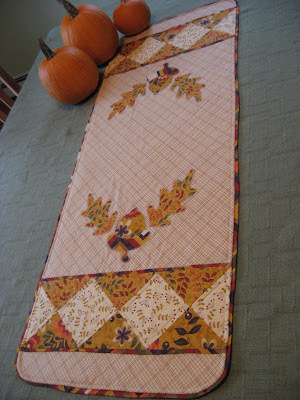 This was a very relaxing project to work on through the fall and into the cold winter, and I was a little sad to have finished it just as the bitter cold weather descended upon New England. But it was good to use up some scrap yarn and acquired some new shades of discontinued Bernat Waverly that I really love. Now I have no cozy afghan to keep my lap warm in the evenings, but I am working on another crocheted afghan project that I will share here soon. It's just not at the lap-warming stage yet and probably won't be until the cold weather is on its way out. Aw, that's life! 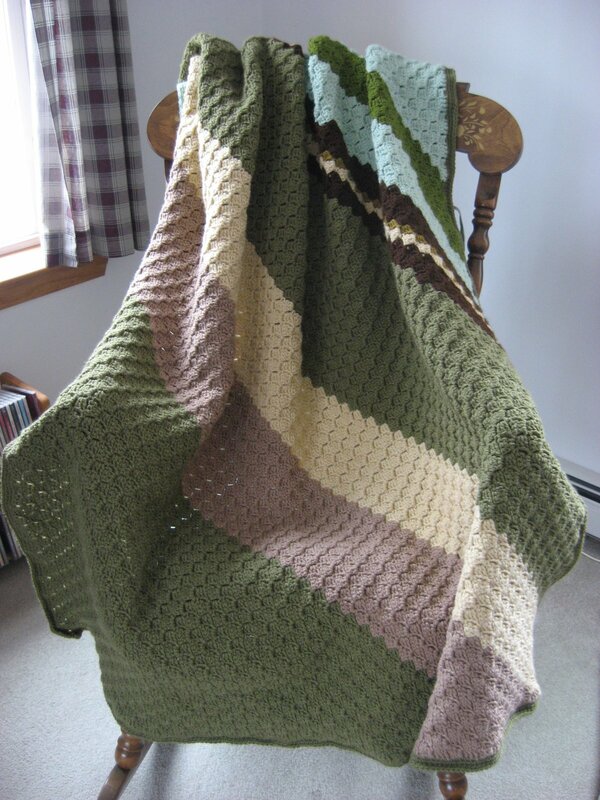 Lovely afghan - what a creative way to use up your yarn. 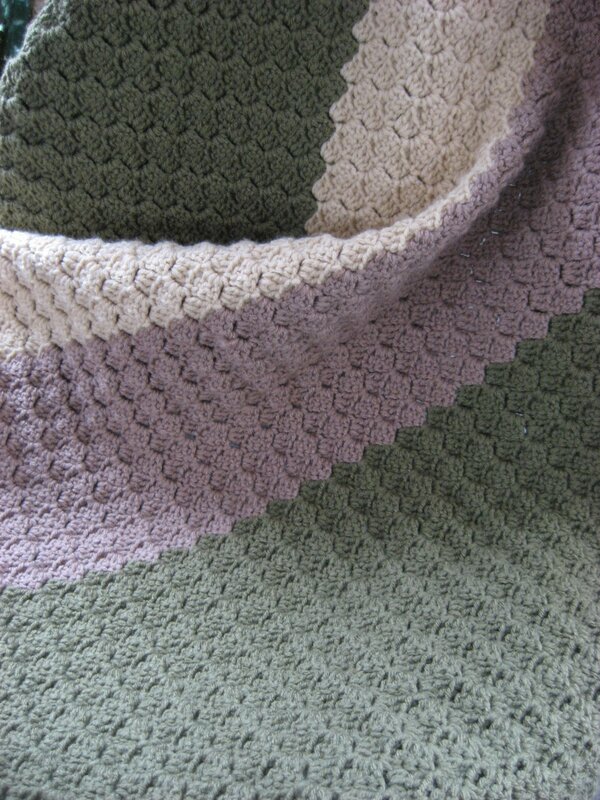 I loved Bernat Waverly - still wonder why they discontinued it. Hope you are keeping warm and that the big storm does not hit your area. I sounds like it could be a whopper of a storm. Keep safe! Gorgeous afghan, Mary Grace. I love the colors. 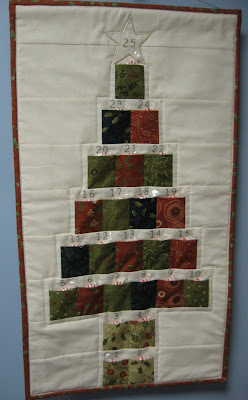 Looking forward to seeing your next project, at the appropriate time.